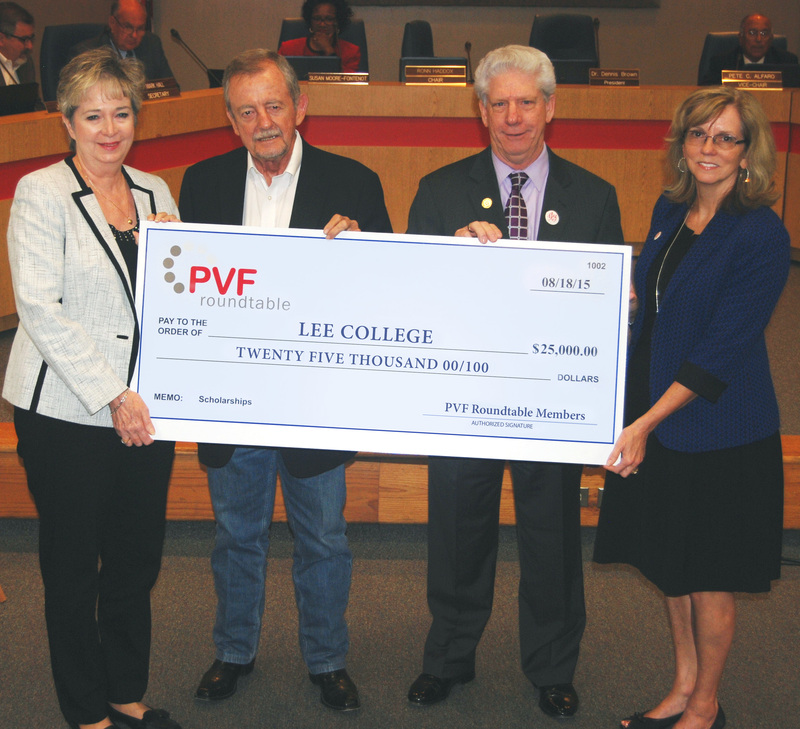 Lee College was awarded this month a $50,000 grant from The Fluor Foundation to support industrial training programs, and provide college scholarships to Goose Creek and Barbers Hill students interested in pursuing industrial careers. Representatives from Fluor Corp. and The Fluor Foundation presented the $50,000 check at the December meeting of the Lee College Board of Regents. In addition to scholarships, the grant money will be used to purchase training equipment that enhances hands-on learning in the classroom. Fluor reached out to Lee College in 2013 to forge a partnership that would address the growing demand for the next generation of skilled workers. Since that time, the company has helped recruit students for industrial training, offered valuable insight about how to improve and update program curricula, and given job opportunities to graduates. Torrence Robinson, president of The Fluor Foundation and senior director of Global Community Affairs, told the regents that Fluor is dedicated to developing the workforce that industry needs to be successful. Supporting quality educational initiatives is an essential part of that effort, he said. “We are committed to helping provide the resources that you need to do your job even better, and we look forward to our continued partnership with Lee College,” Robinson said. Lee College Pres. Dr. Dennis Brown and Board of Regents Vice Chairman Ron Haddox thanked Fluor and The Fluor Foundation for their generosity on behalf of the entire campus community. “I can’t tell you how much this means to us, and more importantly, how much it means for our students,” Brown said. Lee College received this month a $250,000 suite of digital computer equipment and software from Mitsubishi Electric Corp., which will be used to train students for a range of high-demand, high-wage technical careers. The donation included state-of-the-art Mitsubishi programmable logic controllers (PLCs), as well as associated software and training for instructors. Company representatives joined Lee College Pres. Dr. Dennis Brown, members of the Board of Regents and other administrators for a ribbon-cutting ceremony Friday, May 2, at the McNair Center to get a firsthand look at the PLCs before students begin working with them. An essential piece of equipment in many industries, PLCs help automate electromechanical processes — from the control of a vent fan in an oil refinery, to the motion of a conveyor belt on a factory assembly line. Technicians use specialized software to program the systems to produce the desired function. In thanking Mitsubishi for its generosity, Dr. Brown noted that Lee College is fortunate to have strong connections with many industry partners. Such relationships benefit students by providing enhanced educational resources and greater opportunities for future success, he said. Mark Werthman, director of the technical support group for Mitsubishi, said he hoped its donation would further bridge the gap between industry and education. Finding qualified employees is important to both the company itself, and the customers that purchase its products.